Editor’s Note: I have to make particular mention of the film’s excellent and comprehensive web site. The directors have done a great job using the web to generate interest and obtain screening dates in cities across North America. As a result of audience interest expressed on the web site, the film will open in Toronto on April 25th and play until May 1st (with a possible extension depending on ticket sales) at the Carlton Cinema. Check the link the week before for showtimes. 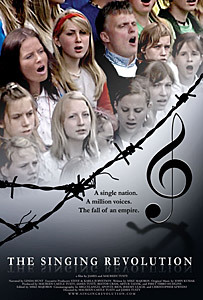 The Singing Revolution (2006, Directors: James Tusty and Maureen Castle Tusty): My wife and I are big fans of small countries. We will visit Iceland this fall and have taken holidays in Cuba, Slovenia and Uruguay in the past few years. There’s something inspiring about the indomitability of small nations, especially if they’ve been forcefully occupied or dominated by other countries. Estonia certainly fits the bill, and my dream trip is to one day spend a week each in Estonia, Latvia and Lithuania. James Tusty and Maureen Castle Tusty are a husband and wife team who have documented the unique struggle of Estonia to emerge from the Soviet Union as an independent nation, and they’ve created a wonderful film. For most of its history, Estonia has been dominated by much larger countries, and the 20th century was particularly cruel. This country of just over a million gained its independence in 1920 only to be invaded by the Soviet Union in 1939. As World War II raged, Hitler’s armies occupied Estonia as part of their invasion of the Soviet Union, and so there was another foreign occupier. By 1944, though, the Nazis had been expelled by the resurgent Red Army and for the better part of the next half-century, Estonia was occupied by Soviet troops and forcibly integrated into the USSR. But Estonia also had a very strong cultural tradition of folk singing, and despite its small size, possesses one of the largest collections of folk songs in the world. Every five years since 1869, a huge folk singing festival called Laulupidu was held in the university town of Tartu. At these events, huge choirs of 25,000-30,000 would sing on stage at the same time, expressing their unity and pride in their national identity. During the Soviet occupation, these festivals were practically the only allowed outlet for Estonian culture, despite being, for the most part co-opted to promote Communist ideas. At the end of the official program (Communist songs sung in Russian), the choirs were allowed to sing three or four songs in Estonian. At the 1947 festival, Estonian composer Gustav Ernasaks presented a new song he’d written based on a century-old Estonian poem. â€œMu isamaa on minu armâ€ (â€œLand of My Fathers, Land That I Loveâ€) became the unofficial Estonian national anthem and was sung lustily by the crowds at each festival. In 1969, at the centennial of the festival, the Soviet authorities banned it, but the crowds spontaneously took it up and sang it several times. It’s clear how much singing and this festival meant to the Estonian national identity. When Mikhail Gorbachev came to power in 1985 with his policies of “glasnost” and “perestroika”, the Estonians saw their chance to reclaim their culture and their independence. Political dissidents used music to inspire protest, and by 1991, Estonia had declared independence. Unlike its Baltic neighbours Latvia and Lithuania, there was no violence despite the threat of Soviet retaliation. The Estonian character values patience. As narrator Linda Hunt expresses it, “patience is a weapon, caution, a virtue.” Because of their small size, the Estonian resistance knew it could never triumph by force, and so they carefully navigated a very delicate process and achieved a practically bloodless victory. The film does a good job of documenting these amazing and tension-filled days. Today, Estonia is a thriving democracy, a member of NATO and the European Union. The music festival continues, and for those who were involved in this still-fresh revolution, it is a place to share their memories with their children. And of course to sing â€œMu isamaa on minu armâ€, loudly and without fear. If I have one small criticism of the film, it would be its microscopic focus on Estonia to the exclusion of the other Baltic Republics. There are a few tantalizing mentions of events going on in Latvia and Lithuania (in particular, a protest where citizens of all three countries joined hands and created a 600km long human chain to protest the Soviet occupation), but it would have been enlightening to see in more detail how these three small countries worked together to take on the entire Soviet Union. Three distinct cultures, yes, but also three necessary allies. Perhaps that story will have to wait for my own trip. This entry was posted in Documentaries, Theatrical Release and tagged baltics, choir, communism, estonia, history, music, politics, singing. Bookmark the permalink. What a wonderful story and testimonial to the power of ordinary people and the power of music. This sounds like a film with a very important message to Canadians, who feel so powerless in the face of the challenges of globalization and environmental degradation caused by forces much greater than any of us individually. Interestingly the majority of us also see music as an activity marginal to the demands of “real life.” Perhaps it’s time we begin to reassess the place of music in life and begin to look for ways to emulate the Estonian example. I cannot think of a better way to begin than to go to “The Singing Revolution.” I’ll be there. This movie was okay but left out any reference to the US and the pressure Ronald Reagan put on the Soviet Union. It leaves you thinking Estonians clinging to their national anthem broke Gorbachev! This film is obviously not done by a historian. No mention of Reagan’s military build up, economic pressure and firm talks with Gorbachev to let democracy in. For that matter, no mention of the Soviet Union’s other internal problems, conflict within the party, the disastrous invasion of Afghanistan, etc. I don’t think any ONE thing caused the downfall of the Soviet Union, despite what Reagan and his neoconservative admirers think. Thanks for your comments, Allan and Annaka! I must agree with Annaka. It was an average movie with not much historical reference. Though James McNally may accuse me of also being a “neocon”, I like to think I’m just a fan of history–not affiliated with any political party. I agree, there were other forces weakening Gorbachev, but the US and Reagan was certainly a huge part of it. To deny this is simply being a revisionist, which liberals seem to be good at.